Hormel Foods (HRL) was founded in 1891 and has proven to be one of the most resilient food providers in the world. The company’s brands include Skippy peanut butter, SPAM meat, Dinty Moore stew, Wholly Guacamole dips, Jennie-O turkey, and numerous Hormel-branded meat products. Perishable products (fresh meats, frozen items, refrigerated meals) account for 56% of Hormel's revenue, followed by poultry (19% – turkey), shelf-stable goods (19% – canned meats, peanut butter, hash, stews, chips, etc. ), and miscellaneous products (6% – nutritional food products, dessert and drink mixes, etc.). Refrigerated Foods (50% of sales, 50% of profits): sells branded and unbranded pork, beef, and chicken products for retail, foodservice, and deli customers. Grocery Products (26% of sales, 29% of profits): sells shelf-stable food products predominantly to the retail market (Walmart accounts for more than 10% of company-wide sales), as well as nutritional and private label shelf-stable products to retail, foodservice, and industrial customers. Jennie-O Turkey Store (17% of sales, 14% of profits): sells branded and unbranded turkey products for retail, foodservice, and fresh product customers. International and Other (7% of sales, 7% of profits): sales of Hormel’s products in international markets such as China, where the company is working to double its capacity by 2020. While international is the smallest business segment, it's also the fastest growing. Over 90% of Hormel's sales are derived in North American today, but the company should become more geographically diversified over time. Most of the firm's products end up on retail grocery shelves, but a meaningful portion (28% of revenue) are sold to foodservice operators. Hormel Foods has raised its dividend for 53 consecutive years, making it a dividend king. 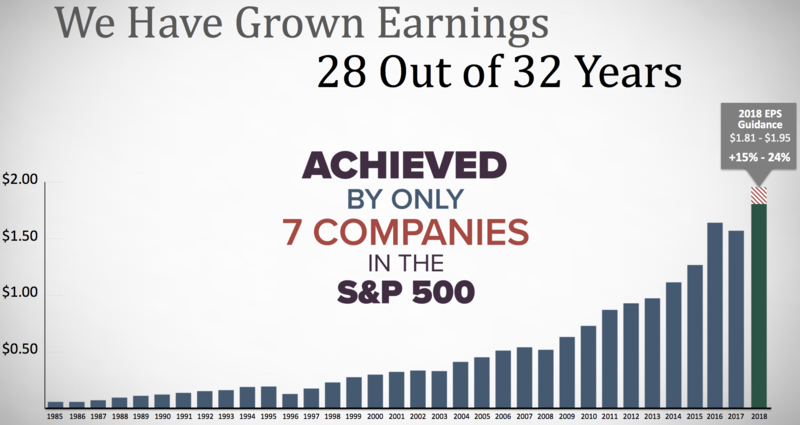 The company has also paid uninterrupted dividends every quarter since 1928. Few companies survive for more than 125 years. Hormel's competitive advantages are not about patents (Hormel only has 54 global patents) or intensive spending on new product development (the company only invested $34 million on R&D last year, representing less than 0.4% of revenue). As one of the largest consumer-branded food and meat manufacturers, Hormel’s key to success is favorably altering customers’ perceptions of its products to gain loyalty and market share. The company routinely spends around $150 million on advertising, an amount nearly five times greater than Hormel’s spending on R&D. With many of its brands dating back over 50 years (e.g. SPAM and Dinty Moore were introduced in the 1930s) and supported by billions of advertising dollars over the years, many consumers know and trust Hormel's products. 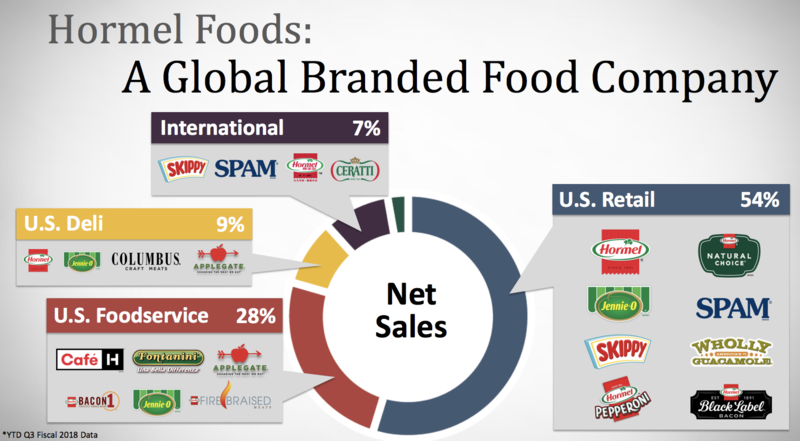 As a result, more than 40 of Hormel’s brands have No. 1 or No. 2 market share positions in their respective categories. The company estimates that No. 1 or No. 2 brands represent approximately 60% of Hormel's retail sales. Thanks to its portfolio of well-known brands which can be expanded into new categories, by 2020 Hormel seeks to generate 15% of its revenue from new products launched within the past five years. At the end of 2018 that figure stood at 14%, meaning the company is well on track to achieve its goal of continued product innovation. Beyond brand recognition, retailer relationships, and shelf space market share, Hormel also benefits from economies of scale. As one of the larger players in the market, Hormel is able to achieve lower production costs than smaller rivals and squeeze more value out of each advertising dollar it spends by extending well-known brands into adjacent product categories. Extensive regulations by the U.S. Department of Agriculture also disadvantage smaller competitors. 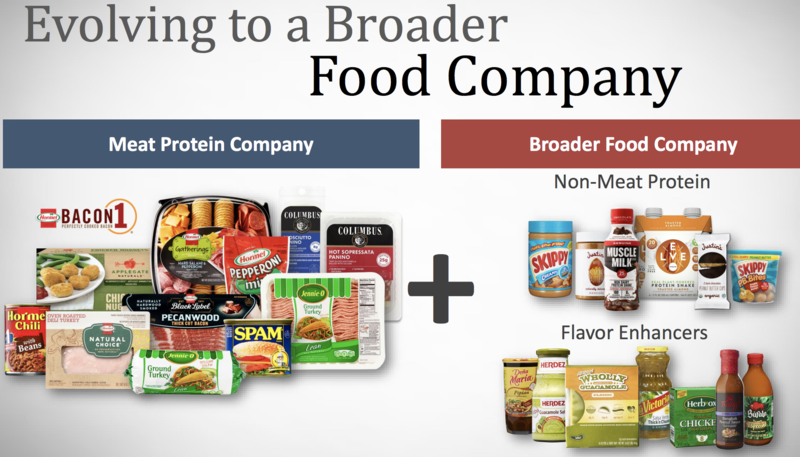 Hormel can sell these new brands and products to its existing customers and improve the cost profile of each acquired company once they are integrated. While meat-based offerings will always be core to the company, many of these deals expand Hormel's non-meat portfolio as well, helping to ensure that its products are located where the consumer is shopping. Besides carefully selecting the brands and product categories it plays in to improve profitability, Hormel has a strong track record of cutting costs and becoming more productive. Hormel’s corporate culture is all about long-term profit maximization, which has allowed it to generate some of the strongest and most consistent profitability in the industry over time. 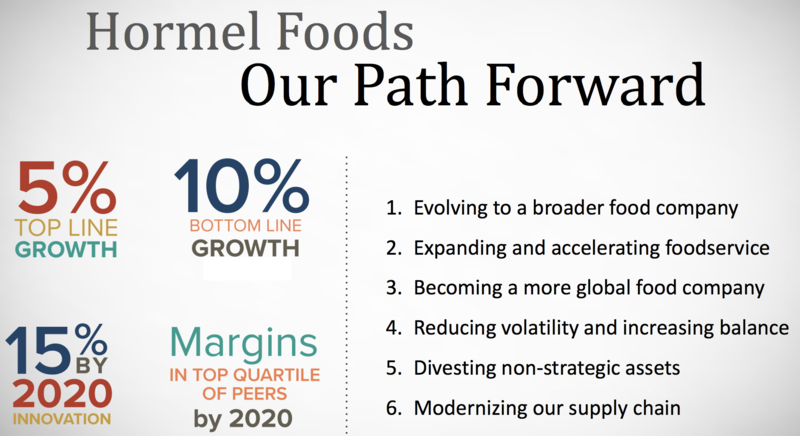 Combined with both organic and acquisition-fueled growth, Hormel has managed to achieve positive earnings growth with consistency that few other companies can match. Part of what explains Hormel’s amazing track record is the company’s unique corporate culture. Specifically, Jay C. Hormel, the founder of the company, believed that corporations exist to serve the interests of all stakeholders, not just shareholders. That’s why he founded the Hormel Foundation in 1941, which over the past 75-plus years has donated more than $225 million to charities in the Austin, Minnesota, community. Today the foundation owns around 5% of outstanding shares and 48% of voting control in the company, ensuring that the company is always focused on growing long-term wealth to both enrich investors as well as its local community. This helps explains why Hormel has such a well-balanced capital allocation strategy, in which management spends the company’s cash flow on a good mix of organic growth, acquisitions, as well as capital returns to shareholders (including the Foundation), including its notable 53-year dividend growth streak. Management is confident Hormel can continue improving its profitability, cash flow, earnings, and dividends going forward. When combined with the company's even higher dedication to R&D and more focused brand advertising, Hormel has reasonable potential to continue growing at a similar pace in the coming years, with top and bottom line growth of 5% and 10%, respectively. If Hormel can achieve its long-term growth objectives, then investors can likely expect many more years of consistent dividend increases. As long as consumers need to eat, Hormel's well-known brands will be there for them. But while Hormel is a well-run company with many positive attributes, several risks could affect the firm's long-term growth potential. While Hormel’s dividend king status and continued strong execution make it a fundamentally low-risk company to invest in and arguably one of the best consumer foods companies in the market, there are nonetheless some challenges the company will have to contend with in the coming years. For one thing, while Hormel has done an admirable job diversifying away from traditional commodity meats and into higher margin value-added brands such as Jennie-O, Justin’s, and Applegate, around 13% of its product mix is still in relatively commoditized meats. It’s harder for Hormel to maintain stronger pricing power in these areas, especially in an age of changing consumer preferences. For example, today more consumers are avoiding the center of the grocery store (i.e. pre-packaged foods) in favor of the fresher, outer rim of the store. The company notes that approximately 40% of its total sales are in the perimeter of the store, which is better than many of its peers but could still create growth headwinds as consumer preferences continue evolving. In addition, while Hormel raises a lot of its own pigs and turkeys, which decreases its exposure to commodity prices, feed prices for those animals are still outside management’s control, as are pork and turkey prices. In fact, commodity price volatility is a big reason why Hormel has struggled in recent years. Next, it's worth mentioning again that over 50% of the company’s sales are derived from grocery stores. Hormel doesn’t just have to deal with competing products from rivals, but it also must work with large grocery chains such as Walmart (WMT) and Kroger (KR). As disruptive e-commerce giants such as Amazon (AMZN) potentially make a stronger push into America’s grocery market, large grocery chains could put increasing pressure on Hormel to lower its wholesale prices so that they can compete with Amazon’s ultra-low prices and invest in their own digital operations. This would make it even more important for Hormel to squeeze out more and more efficiencies from its production lines in order to achieve the kind of long-term earnings growth management is targeting. Which brings up the final notable risk, Hormel’s steadily increasing size. In order to move the growth needle, Hormel will likely have to accelerate the pace of its acquisitions in the future, either by purchasing smaller niche brands more frequently or buying larger, more established businesses. The problem is that at the higher end of the packaged food industry it’s often much harder to find good values, thanks to today’s cheap cost of capital and large-caps such as Kraft Heinz (KHC) and Tyson Foods (TSN) bidding up the prices required to close such deals. In addition, a lot of Hormel's success in previous acquisitions came from buying underperforming brands such as Skippy peanut butter, which despite being the No. 2 brand in America was suffering from mismanagement and underinvestment. That made it a great acquisition candidate with plenty of low-hanging fruit when it came to taking out costs and making brand-building investments. Management says the integration of Columbus premium deli meats (Hormel's last big acquisition for $850 million) is going as planned, but all big M&A deals come with execution risk, and no management team is perfect. For example, in early 2019 Hormel announced it was selling Cytosport, maker of Muscle Milk, to PepsiCo for $465 million. In 2014 Hormel paid $450 million for business but sales fell from $370 million to around $300 million since then. Despite increasing distribution significantly, Muscle Milk faced intense competition that resulted in sales declining. Fortunately, Hormel was still able to sell the company for $15 million more than it paid for it four years ago thanks to the asset inflation that has occurred for food companies in recent years. Going forward, Hormel may not be able to find enough high-quality brands available at a good value that fit management’s strict capital allocation criteria, potentially resulting in slower earnings, cash flow, and dividend growth in the future. Dividend growth investors should also note that Hormel's dividend growth rate will likely slow going forward. Over the past decade Hormel grew its dividend 15% annually. However, the company's free cash flow payout ratio also expanded from 22% to around 50%. As a result, future dividend growth will likely have to slow to match the pace of Hormel's earnings growth, meaning income investors should expect high single-digit or low double-digit dividend increases. When it comes to proven track records, quality management teams, and shareholder-friendly corporate cultures, it doesn’t get much better than Hormel Foods. While short-term headwinds, such as volatile commodity prices and decreased exports to China, may weigh on the business in the next year or two, these issues do not seem likely to affect Hormel's long-term earnings power. The company also owns a more on-trend product portfolio compared to many other food giants, positioning it better to deal with consumers' increasing tastes for fresher, healthier, and organic offerings. When combined with Hormel's solid balance sheet, numerous opportunities for long-term growth, recession-resistant portfolio of well-known brands, strong profitability, and impressive dividend growth track record, this seems like a business that will almost certainly be around for a long time to come.